So my sons are both out of elementary school, but I maintained my loyalty to their former school’s spring plant sale anyway (a decade’s worth of habits die hard). One of the things I bought was a six-pack of different tomato plants. Now I know that six tomato plants is too many, even for a family that likes tomatoes. My older son used to just eat cherry tomatoes like candy. As a toddler, I would take him to the local co-op, put him in the grocery cart seat and give him a carton of organic cherry tomatoes to munch on while we shopped. Still, in past years I’ve limited myself to just two plants of heritage tomatoes from the farmer’s market. Plenty. But this year the combination of winter and the tempting array of tomatoes in the pictures (Big Boy! Super Sweet! Those cool yellow ones!) on the order form was too much for me. And now I am seeing the consequences of my lack of restraint. So many tomatoes, all ripe at once. I filled up a big colander just a few days ago and will need to go out again very soon. So what does this have to do with skating? Biting off more than I can chew? Too many things to work on? 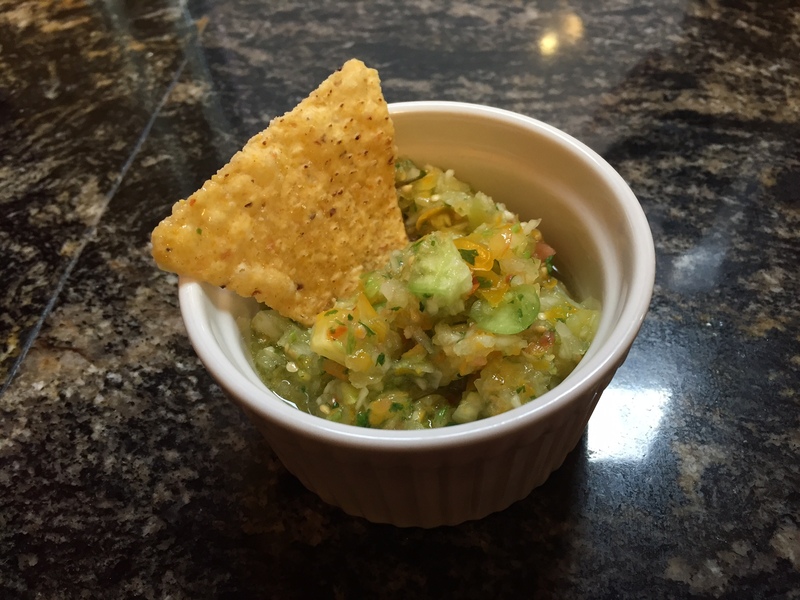 Actually not much, but I wanted to share my gazpacho recipe. It’s adapted from an old copy of The Colorado Cache Cookbook that I got many years ago. Chop up the first six ingredients into pretty small pieces (especially the green pepper), then add the others and chill. Yes, it’s that easy, aside from the chopping. And it’s great for a hot summer day, as if skating weren’t chill enough. Categories: recipes | Tags: adult figure skating, adult skating | Permalink. Deep cravings for pudding? Thinking about going over to the dark side of chocolate? Here it is, sans wobble. 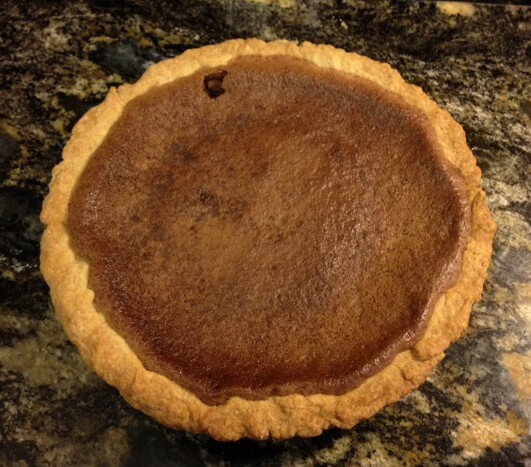 This is a variation on a recipe I found on a blog called “Almost Slowfood“; it was inspired by Karen DeMasco’s recipe for chocolate pudding in The Craft of Baking. DeMasco bakes hers in a water bath, but Peggy Boujaily does hers with semisweet chocolate on the stove. No added sugar, so it’s much more bittersweet than the average chocolate pudding. I can actually eat this and then eat an orange afterwards without going into major mouth-pucker mode. I don’t think it’s too bitter, but my sons do, opting instead for the wonderful chocolate chip cookie dough pudding that Eva makes when she’s not too busy skating. That’s okay; this way my husband and I have the entire batch to ourselves and everyone is pudding-happy. 2-3 oz. chopped bittersweet chocolate (70% or more). Since my variation has no additional sugar, you may want to add 2 oz. first and then taste test. For the oven version, preheat the oven to 275 degrees. Add the cream, milk, vanilla and salt to a medium pot. Set over a medium high heat and stir until nearly boiling. Add the chocolate and stir continuously until melted. Dip a ladle into the chocolate mixture and very very slowly add to the egg yolks while vigorously whisking; for me, this worked much better with a kitchen helper since I have trouble pouring slowly while whisking vigorously (no wonder skating is a challenge). Whisk the egg yolk mixture well and then pour it all back into the pot. If you are doing this on the stove, moderately boil the pudding (and keep whisking!) for a few minutes until it feels thickened. You’ll feel a difference almost immediately once the egg yolk mixture is added. Then remove from the heat and pour into serving dishes and refrigerate until set. If you are doing it in the oven, individual ramekins go into a water bath and then into a preheated over for 20 minutes. Then chill before serving, unless warm pudding is your thing. I like this plain, but the rest of my family goes for whipped cream and maybe some strawberries. Made with one of the final batches of cherry tomatoes and tomatillos from the garden, along with some onion, jalapeños, and cilantro. Between that, the Pope’s visit and the awesome super moon eclipse last night, it’s been quite a couple of days. I wasn’t sure I could take any more excitement. But add to that some amazing skating insights, and whoa, man, adrenaline rush! 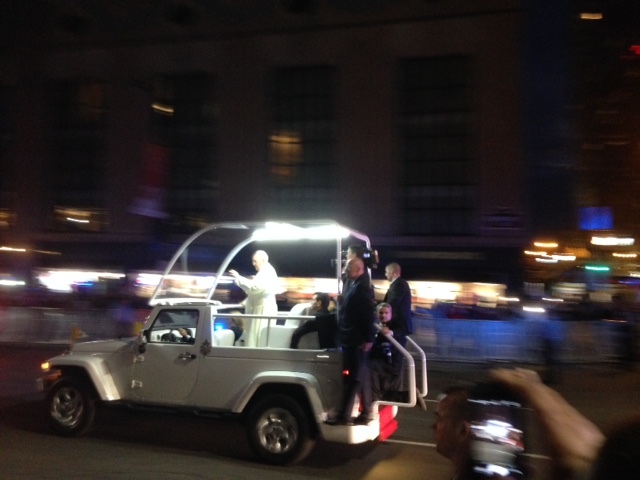 Okay, I didn’t actually see the Pope (this photo was taken by my sister) since his visit brought him nowhere close to Minnesota. But the amazing skating insights are mine, all mine. Of course, many of them come from ASCs Laurie and Ari, and now they are yours to try too if you are reading this. So they also belong to many others–which is more than okay because, like fresh salsa, papal blessings, and the wonderful moon, there is more than enough to go around. ASI #1: My left hip has never really been beneath me. If I move my hip forward, engage my glutes, and allow the left hip flexor not only to extend but also to stretch, then it is finally beneath me. I have been doing this off-ice stretch to reinforce this. Oh, and by the way, my right hip is sometimes not beneath me either. But now I know what to do! ASI #2: I need to use my feet to push. Not just my leg, but the foot, the whole foot (and nothing but the foot) which moves down into the ice and then stays there. Boom. That stop motion of the foot extending everything back is what I’ve been missing whenever I push onto a forward outside edge. Laurie told me to think of the foot as the tip and the rest of me squirting forward as if I were a pastry bag. It works for me, okay? Pastry bags I can handle. ASI #3: Everything is about circles. Legs go in, legs go out. Feet come in, feet come out. Brain kicks in, brain. . . . Everything is about circles. A number of years ago, some of my friends and I started an annual cookie exchange. For me it has morphed into a cookie/candy exchange; last year my contribution was Andes mint fudge and this year I made pecan pie truffles. There are a number of recipes out there that use bourbon, but this one is sans alcohol. Easy to make, no baking involved (except to toast the pecans), and delicious if you are not nut-free or chocolate-averse. I got this recipe from a blog called “High Heels and Grills“, the blogger there adapted it from Style Blueprint. I chopped the nuts (coarsely) in the food processor after toasting them at 375 degrees for just a few minutes, then used the same food processor bowl to make graham cracker crumbs (there are around 9 standard double graham crackers in a cup of crumbs). Refrigerate mixture for 15 minutes. I stuck them in the front door entryway, which is cold. Or you could try the garage (up on a shelf, away from mice). Melt the dipping chocolate. (Some bloggers suggest 16 oz. of pre-packaged dipping chocolate. I use around 8 -12 ounces of chopped dark or semi-sweet chocolate and maybe a scant teaspoon of vegetable oil (you could use butter too), melted by microwave on high for 30-seconds at a time and stirring in between. I stop heating when there are still a few unmelted pieces, then stir until the chocolate is melted and smooth. 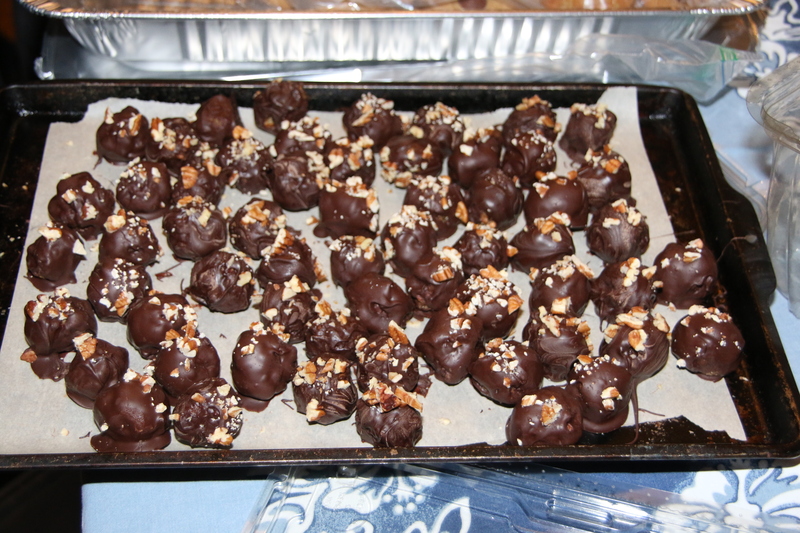 Coat the truffles with chocolate (you can dip them with a fork, or use fingers). Scrape dripping chocolate off the bottom back into the chocolate bowl and place them wax paper. 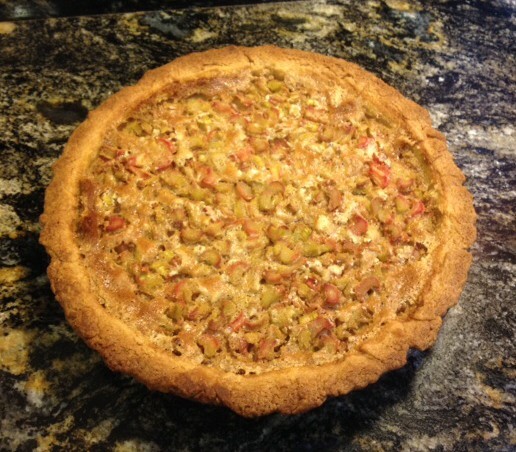 Categories: recipes | Tags: pecan pie truffle | Permalink.